LPMS Express is an emerging bus company based in Perak. They specialize in providing local bus service within Perak and long-distance bus service going to or from Perak. As the company grows bigger, they are improving to provide more routes for their customers. By joining BusOnlineTicket.com, LPMS Express now also offers online bus ticket booking for the convenience of their customers. 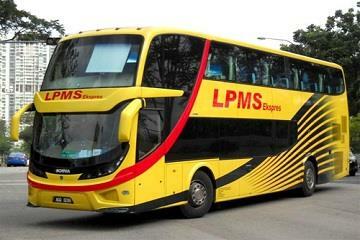 LMPS Express coaches are neatly designed and easily recognizable for its yellow color. The seats in LPMS Express are arranged 3-seats-in-a-row. You will find the spacious seats very comfortable for the long journey. The quality service by LPMS Express is also part of the reasons the bus company has quickly becoming passengers’ favourite choice to travel to their destinations. With BusOnlineTicket.com, LPMS Express is offering bus from Sabak Bernam, Sekinchan, Simpang Empat, Sungai Besar and Teluk Intan to Singapore or Johor Bahru. The drop-off point in Singapore is in Golden Mile Complex where the drop-off point in Johor Bahru is at JB Larkin Terminal. Both Golden Mile Complex and JB Larkin Terminal are famous departure and drop-off point for long-distance buses. You will find many facilities built to accommodate for your needs there. Book your bus tickets with BusOnlineTicket.com now!